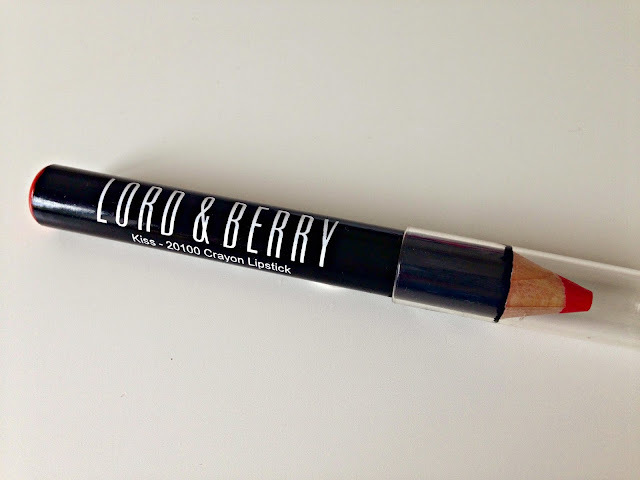 Lord & Berry Lipstick Pencil in Kiss 20100 Review! Glossybox Glossybox Glossybox. We've had a few difficult times over the past couple of months but recently you've started to make an effort to know what I like and I can really tell a difference in you. Instead of sending me copious amounts of skincare products or multiple mini palettes from So Susan, you've actually started to send me products I'll actually use! Thank you! In April's Glossybox the theme was Hollywood Glamour and one of the products that was meant to promote the glamorous lifestyle of Hollywood Beauties was the Lord & Berry Lipstick Pencil in Kiss. At first it seems like a very striking bright red but after testing it I fell in love with it! I don't think you can tell so much from these pictures but this lip pencil is amazingly pigmented! From these pictures alone, the shade would look like a bright red but in actual fact it has a gorgeous orangey coral undertone! Although I've made it quite clear in other posts that I do NOT like bright lips on myself, this pencil has now become my little dark secret. I will probably never wear it out but I'll always know how fierce and glamorous it can make me look! If you were unfortunate to not be signed up with Glossybox, don't worry! You can check it out over on the Lord & Berry website! Wow! Such a gorgeous shade! Looks great on you! Beautiful shade! Your lips look flawless!! I love this colour and you have great skin! This shade makes you look so fierce, I really do hope you wear this out because it suits you so well! That colour is gorgeous - it looks lovely on you! I have been on the hunt for an orangey red and that one is just so pigmented. It's just so tempting! That shade looks gorgeous, it's so vibrant yet wearable! This shade is beautiful on you and you should definitely wear it out!